Serving you for a lot of time during your Yangtze River cruise trip, the ship rooms are really important to give you a comfortable stay onboard the cruise. Here we will show you the room types, room facilities and amenities, room services for guests in suites, how to choose a room, some accommodation tips, and so on, for you to have a better understanding about the cabins and suites onboard. Check the details at below before your decision of which cruise room to choose for your Yangtze holiday. Rooms are classified into different types, usually 3 – 6 types, and names according to different Yangtze River cruise companies. However, there are mainly three types of different levels for the needs of different traveller guests from the world, namely the standard cabins, the business cabins or called executive cabins, and the luxury suites. Usually, rooms of higher level offer more space, more facilities and better experience for your trip. See the range of size, location, features of each kind of room now. Room size: 13.00 to 31.00 sq. m.
The standard cabins onboard the Yangtze River cruise belong to the basic level. Usually to meet the most common demands of accommodation of guests, the cabins are good decorated and equipped with 2 single beds, central air conditioner, LCD television, satellite programs, telephone, dresser, private bathroom with shower (some even with bathtub), toilet, wash basin, and so forth. Besides, in some standard cabins of some cruise ships, there also prepare a safe box, a tea table, a desk with a chair, mirror, etc. for your needs. 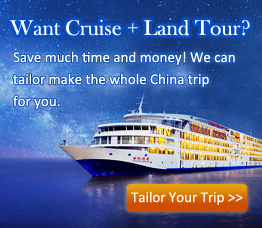 All Yangtze River cruises provide good standard cabins for your choice. But, Century Legend and Century Paragon offer that of about 28 square meters wide, which ranks the top largest one. With advanced technology and equipment, the water is purified and sterilized before available into your cabin, therefore, you can drink it after boiling and use it to do some simple laundry as you like. Those two ships are really great choices for people who want to choose the standard cabin with limited budget. Room size: 26.10 – 72.00 sq. m.
Relatively larger than the standard cabins, the business & executive cabins are arranged on the middle and upper decks of a Yangtze cruise ship to provide a quieter and more private environment for you. Offering all the same amenities in the standard rooms, these more spacious cabins also are equipped with larger bathrooms with bathtubs, larger private balconies, tea tables, sofas, etc. in order to give you a better stay onboard. Besides, in most business & executive cabins, to suits the common needs of guests on a business trip, there is a separate bedroom or a lounge with a curtain for separating from the sleeping area. Victoria Cruises and Yangtze Gold Cruises provide the larges executive and business cabins, which cover 36.00 – 72.00 square meters wide. Onboard ships of Victoria Cruises, people choosing cabins and suites of executive level and above can enjoy dining in the VIP A La Carte Restaurant that is more private and quieter with less people. Besides, Victoria Cruises is under the American management, which is the only on company on the Yangtze, so people from the America, Europe and Atlantic, etc. can be satisfied really well. Onboard ships of Yangtze Gold Cruises, you can enjoy quiet cabins with the sound of about only 40 decibels, which is even lower than that of an ordinary air conditioner, which is due to the use of the praising skill of damping and noise-reducing when constructing the ship. Besides, you can have a comfortable stay in your holiday, because the rooms all the rooms are well decorated and designed with high criteria to meet your high needs. Room size: usually more than 100.00 sq. m., some over 70.00 sq. m.
Onboard the Yangtze River cruises, there are usually 1 to 4 luxury suites prepared for the utmost enjoyment of guests. These rooms are really spacious, usually over 100 square meters, and on some relatively smaller ships, they cover over 70 square meters, but still can give you the best stay onboard. In the large and luxury rooms, facilities, amenities, and designs are all the best, with a private mini kitchen, a sitting room, a separate bedroom with a large queen or king size bed, delicate furniture, a private deck with chaise longue, armchairs, a drinking table, a large private balcony for sightseeing, and so forth. Apart from those enjoyments, you can also have some privilege to enjoy many great special services. If you are planning a Yangtze River cruise holiday with the best quality, a luxury suite surely is your best accommodation. The largest luxury suite is the Presidential Suites onboard the President No.7 and President No.8, which covers a super wide area of 198 square meters. For the thoughtful application of the new voice-reducing and damping skill, the room is quiet to meet your demand. And also, the rooms are decorated with the special features of the classic European aesthetic appreciation and the traditional Western culture, which suits your visual enjoyment and better for your holiday enjoyment on the Yangtze. Note: the above information about the room types are only for reference, details varies according to different ships of different Yangtze River cruise companies. In the cabins onboard the Yangtze River cruise ship, there usually prepare cozy beds, pillows and quilts for your comfortable sleeping, clean slippers and shower robes for you to relax your body in your own room. Besides, you can enjoy some relaxing moment in your room, since the television there is accessible with the English and Chinese channels for your recreation. Of course, to benefit your stay in the cabin, central air conditioner, broadcasting system, telephone, private bathroom, shower, towels, sofa, wardrobe, mirror, tea kettles for heating water, glasses, and so on are well prepared in good order in your room. All crews onboard would try every effort to ensure you a nice and satisfying accommodation on the cruise, so if you have any questions or fail to find some facilities in your room, you can directly call the front desk, and staff there would help you sincerely and efficiently. If you book a Yangtze River cruise luxury suite, you can enjoy many distinguished special services for free. Check the appealing services for guests in a luxury suite onboard the ship of Victoria Cruises for reference. Therefore, if you also want to enjoy those great special services without extra payment or if you are planning to travel along the Yangtze River with your family and friends, you are highly recommended to choose a luxury suite. Most cabins and suites onboard Yangtze River cruise ships offer private balconies for your sightseeing and relaxing with friends. But private balcony is not available in cabin types like the Cabin without Balcony on Yangtze Gold cruise ships. You can ask our travel consultant about whether a private balcony is offered in the cabin on your ideal ship. Usually the twin beds in a cabin can be put into a larger queen or king size bed, which is really suitable for a parent traveling with 1 to 2 children and a couple. You can tell our travel consultant when booking if you need this service. However, such service is not provided on ships like Victoria Jenna, Victoria Katarina, Victoria Selina, Victoria Lianna, Victoria Grace, and Victoria Sophia. An extra bed can’t be offered in some too narrow cabins on some small cruise ships on Yangtze River, such as Victoria Cruises. Tell our travel consultant in advance if you need such service. Need extra payment. Onboard a Yangtze River cruise, the cabins are usually arranged from the 2nd floor to the 5th or 6th floor. And for most time, cabins at upper decks are better for sightseeing and enjoy closer distance to the entertainment palaces and the sun deck. However, cabins at lower decks are relatively better for a smoother sailing and closer to the dining hall and the reception desk. If you would like to upgrade your cabin deck after checking in, just tell the staff at the reception desk. They would deal with it based on the room occupation at that time. Mostly, you can succeed upgrading, however, if there is no extra cabins available at upper decks, you can still stay in your originally booked cabin. The deck upgrading service needs pay extra. If booking ships of some Yangtze River cruise companies, such as Century Cruises, early for at least 1 month prior to the embarkation day, you may enjoy the upgrading with nice discount. Please enquire our Travel Consultant for the detailed and updated information of such service. Different room types of each cruise ship need different prices. And if you are not in limited budget and want to thoroughly enjoy your Yangtze River cruise holiday, you can pay more to choose a cabin of high level to enjoy the larger space, more facilities and services. If you are planning a cost-efficient trip, you can also choose the standard cabins and book it early, which may give you a nice discount or at least guarantee the room you accommodate is the room or type you want. Note: the above information of the room types, numbers, sizes, etc. are only for your reference. You can contact our Travel Consultant for more details. And you can check all the popular Yangtze River cruise ships to see their cruise cabins and suites.